Meg Cooch, that's who. But I can forgive her because she sent me this great scouting report on New Mexico after visiting in October for the Albuquerque International Balloon Fiesta. 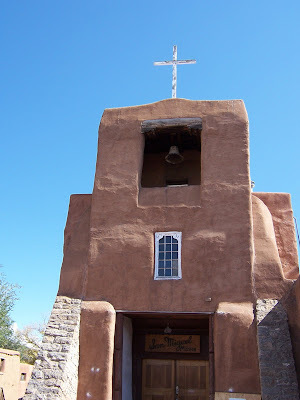 J and I had a fabulous time in Santa Fe and Albuquerque. We spent two days in Santa Fe at an adorable bed and breakfast off the center square called Madeleine Inn, which is also home to the Absolute Nirvana Spa. We loved the fresh cookies daily plus wine and cheese at 5:00 p.m. in front of the outdoor fire. Overall, the food in Santa Fe was amazing, the art fabulous though depressingly expensive and the people super friendly. October is a great time to go - high 70s during the day, low 60s/high 50s at night. The only thing that made us pause was that there is little nightlife beyond 11:00 p.m. or midnight. It is a pretty slow town, but gorgeous. Albuquerque was good as well - far less quaint, but they have a great area near the University of New Mexico, which felt funky and cool. Again nightlife was less active, although there is a strip of bars/lounges in downtown. The balloon festival was a sight to behold - hundreds of hot air balloons in the sky. Watching the balloons glowing as the sun went down was amazing. One downer was that it rained two days in a row so we missed the mass ascension because we were flying out the next morning, but apparently rain is very rare, and they had never really canceled festivities before this year. --Less-than-kicking nightlife, which I had heard before and am debating how much of a factor it is to me. Probably not a major one at this stage. --The spa culture and New Age sensibilities? Groovy. Bring on the zen, even the eccentricity, I say. I like places that embrace individuality, and I plan to get a little kooky in my old age. Bottom line: No real deterrents. Only fuel to my fire. My crush remains alive and well! p.s. 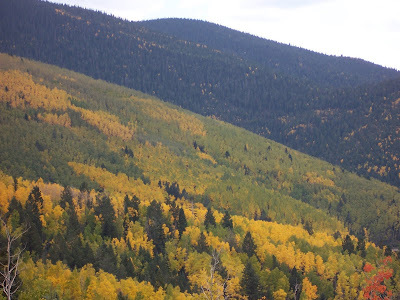 For more photos of Santa Fe in autumn, check out this blog I recently discovered (and plan to follow regularly): http://choosing-santa-fe.blogspot.com/. It's about a woman who decided to leave the big city (Boston, in this case) for Santa Fe in 2006. Here I am finally finding a second to check out your (finally) updated blog and lo and behold, you post something while I am on it! Had no idea that Cooch was on the prowl for you. If you want, I can write something for you on Conc... right next to the hood, lovely sound of BART cruiding through every 10 mins and... an outdoor firepit. Woot! I think a blog on the Conc would be a big hit... think you should definitely consider it! I am in Sedona this weekend -- is that a crush spot for you at all? Jessica, I would love a report on Sedona. I have friends that adore it, and I recently checked out some stunning photos of the waterfalls and red rocks there, etc. So yes, it has all the makings of a crush. Plus, that is where I'm thinking we might want to overnight on the road trip to New Mexico, as it's exactly halfway between LA and Santa Fe. So bring it on!